What is the Southern Youth Summit (Formerly Teen Involvement Conference)? The Southern Youth Summit is a three day youth leadership conference for 4-H member ages 13-18. TIC offers opportunities for 4-H youth to grow through a series of educational workshops, team building activities, motivational speakers, section level youth leadership possibilities, and more! This conference is hosted by the California 4-H Management Board. A 2014 Golden Clover Award Winner: Special Events and Activities. The California 4-H Management Board is proud to announce the California 4-H Youth Summit! Youth Summit events are three day weekend leadership experiences for youth, planned by youth. There are four youth summit events that are open to all 4-H members in California to participate. 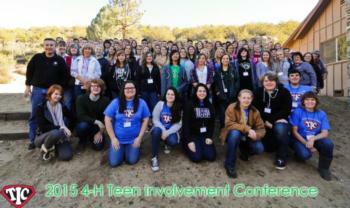 The Southern Youth Summit (transitioning from the Teen Involvement Conference) will be open to intermediate and senior 4-H members (ages 11-19) and will be held in Mountain Center, CA (Riverside County).